Interview with a Zinester: Anna Melton! 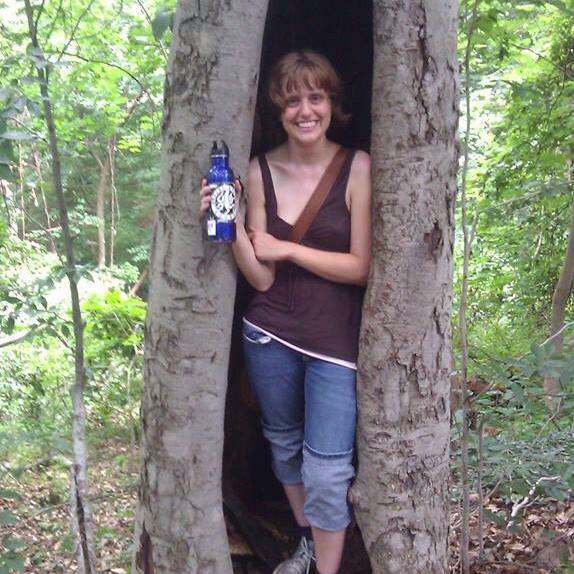 Anna smiling with a water bottle from inside a cleaved tree. I’m Anna, longtime zine reader but relatively new zine maker. As of this spring (!!) I will also be studying to be a registered nurse. Other interests: knitting fiddly lacy things with tiny needles, wondering whether I can ever pull of Janis Joplin at karaoke (and then concluding I can’t and settling for Alanis Morissette), seeing how many Philly public transit routes I can ride in one day, acting as a human scratching post for my kitty, Oscar Wildecat. Dear Rob, my first zine, started to take shape last fall, while I was taking a course to become a certified nursing assistant (CNA). I studied cultural anthropology in a previous life, and Rob was my favorite anthropology professor. In many ways, he”s the person who most profoundly shaped my particular brand of radical politics and intersectional feminism. His suicide in 2012 shook me hard; I actually have a ton of half-started zines from various points since then attempting to process the fallout from that. But it was reading my CNA textbook’s very strange, incomplete definition of “transgender” that really made me ask “what would Rob [a scholar of both medical anthropology and anthropology of the body/gender performance] make of these words?” and sparked a finishable project. I came home from class and wrote him a letter describing how fucked my textbook was, one letter turned into another, and you next thing you know I had a zine on my hands. My second zine, Baby Carrots Micro Aggressions, is a comic version of a dream I had, lovingly drawn up by my friend Maggie. We may collaborate on more zines featuring the “Anna character” later on. Speaking May Relieve Thee, making its debut at FZF, is my attempt to blend two communities I love very much: the zinester/DIY community, and the sacred harp singing community. I first encountered the concept of zines when I read a YA novel called Hard Love by Ellen Wittlinger. The main character, John (zinester alias Gio) loves a zine called Personal Velocity, contrives to meet its author, Marisol, forges this intense, prickly friendship with her, and finds himself falling for her even though he’s known from the get-go that she’s queer. The coolest part of the book for me, besides the authenticity of the relationships, was that it had pages designed to look like the characters’ zines, with faux handwriting and pictures and everything. I was way too sheltered and socially clueless to know that there was a thriving punk/DIY scene happening just up the road from my hometown, so that book was my only exposure to zines for years. Then I had a college roommate who had been clued in enough to actually buy real zines, so I read a bunch of hers. Dated a zinester for a minute while I lived in DC, went to my first zinefest there, and was blown away by the sheer variety of subjects and styles. Meant to write a zine for months, years, after that, but always found myself staring down half-started documents and feeling defeated. Big ups to my zine-making friends here in Philly for giving me that final push to do the scary thing. I wrote Dear Rob, in part, because I was struggling with the gendered aspects of CNA class, both obvious things like the men in class speaking over women, and more insidious things like realizing how undervalued “low level” gendered caregiving work like CNA-ing is, both in terms of recognition and monetary compensation. Feminist zine-making, to me, is taking a broader topic (like my CNA class) and analyzing the ways in which living as a woman in a patriarchal society shapes that topic or experience, for better or worse. It’s hard for me to pick a favorite zine, but I have to give a huge shout-out to On Subbing by Dave Roche. It’s one of the first zines I ever read, and it influenced my writing about my work, specifically how to write about vulnerable subjects both compassionately and critically. I’ll be reading it again as I consider writing more about my current and future jobs. Especially excited to see Sophie Labelle–I’ve been reading and loving Assigned Male for a while now. But really, there are are so many zinesters I’ve never met/zines I’ve never read, and I can’t wait to take everything in. Previous Previous post: Interview with a Zinester: Nicole Harring! Next Next post: Interview with a Zinester: Suzy Gonzalez!